The Rev. Zhaodeng Peng leads the growing Chinese congregation of Tian Fu United Methodist Church, which shares a building with a dwindling Latino congregation in Sunset Park, Brooklyn. The United Methodist church in Sunset Park, Brooklyn, is anything but united. 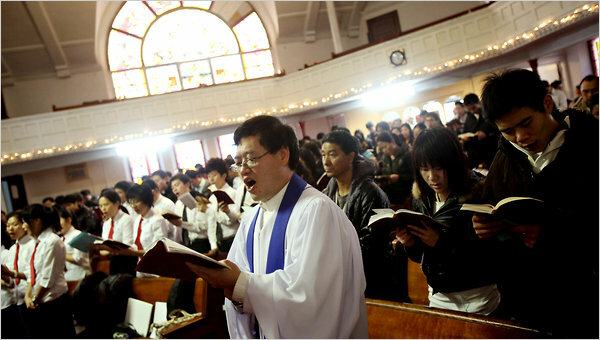 Chinese ushers wait to begin their church services as the Rev. Hector Laporta, who leads the Latino congregation, called the Fourth Avenue United Methodist Church, leaves the chapel. Two pastors preach from the same pulpit and live in the same parsonage next door, but they are barely on speaking terms and openly criticize each other’s approach to the faith. In the church’s social hall, two camps eye each other suspiciously as one finishes its meal of rice and beans while the other prepares steaming pans of chicken lo mein. Two very different congregations share the soaring brick building on Fourth Avenue: a small cadre of about 30 Spanish-speaking people who have worshiped there for decades and a fledgling throng of more than 1,000 Chinese immigrants that expands week by week — the fastest-growing Methodist congregation in New York City. The Latinos say they feel steamrolled and under threat, while their tenants, the Chinese, say they feel stifled and unappreciated. Mediators have been sent in, to little effect. This holiday season, there are even two competing Christmas trees.